After a short break from their favourite late night piece action, they’re back! In true form, they’re setting off on another deep and soulful ride in the beloved Danceteria. Zeus will be playing a three hour marathon of absolute gems and enraptured grooves and will be joined by great friend and co-host, Subaske, who will be wearing the night in. Chris aka Zeus has been collecting some amazing records between playing at parties all around Sydney for the past three years and recently, he has supported the likes of Murat Tepeli, Kyle Hall, Dj Rahaan and Pender Street Steppers. His collection of records spans all varieties of club music and we are all very excited to have him play on the Goodgod soundsystem for an extended session. Maintaining a refreshing dance floor atmosphere through mixing selections from all corners of his record collection, Bass (like the fish) aka Subaske, is easily one of our city’s hidden talents. Having played at recent parties in association with Ghostly and Subsonic, his sets are always received with plenty of interest and enthusiasm from just about anyone there to witness them. As always, expect a dark room & a tuned system and remember to bring hugs and smiles for not only your loved ones but your fellow strangers, too. It’s time for the next dance! 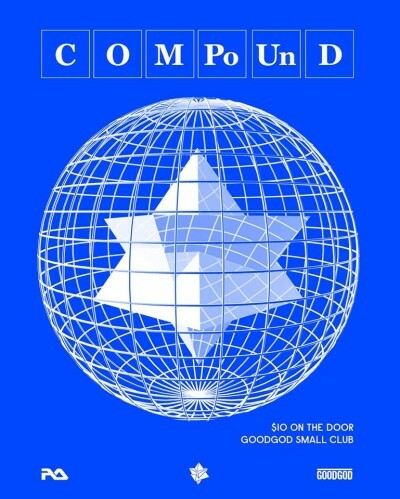 For the 23rd party, Compound founders Zeus and Subaske will be playing in the dimly lit Goodgod Danceteria for your dancing and listening pleasure. 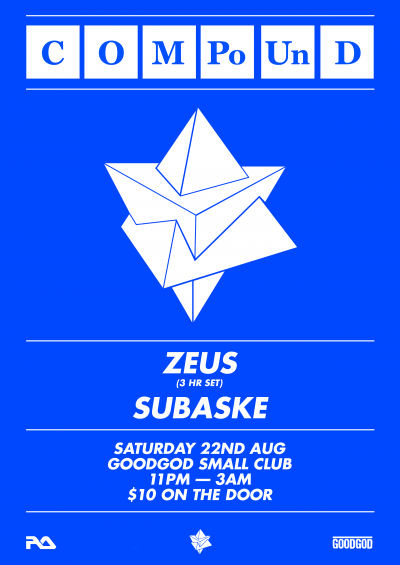 Zeus & Subaske will be playing their most loved music for your mind, body and soul all night long. The last time the pair played together was in October last year for the Compound 2nd Birthday and they’re more than just a little bit excited to be able to play for you again. Bring extra hugs and smiles for your friends, loved ones and fellow strangers and remember to expect a dark room and a tuned system. See you on the dance floor, stay hydrated and much love. 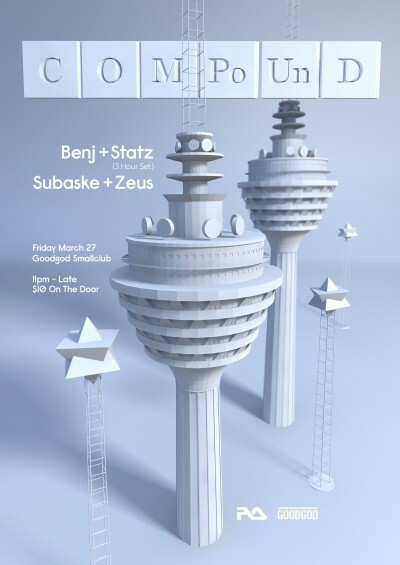 For Compound‘s twenty-second event, good friends Benj and Statz will be joining Subaske and Zeus for a night of rhythm and groove in the Danceteria. Benj and Statz run the We’rehaus parties, which they played a 7 hour set at last year, as well as the lovely Chipped parties. Between Benj and Statz they have a solid collection of music which we cannot wait to hear in the Danceteria. Benj and Statz haven’t played Compound since back in October so we are very stoked to have them back! On support for the night will be Subaske and Zeus – the pair will be spinning together to kick off the night start the vibes flowin! Bring hugs and smiles for your friends/loved ones/fellow strangers. 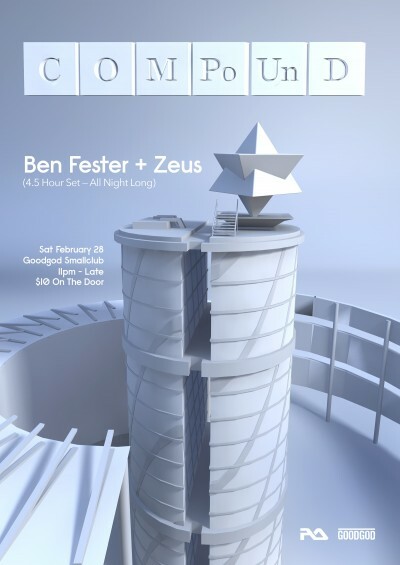 For our twenty-first Compound long-time buddies and music devotees, Ben Fester and Zeus, will be playing together all night long for a 4.5 hour marathon. The pair played together about a year ago at one of our most memorable parties to date, so we’re very excited to have them back at Goodgod. Fester and Zeus have been busy boys as of late with Fester playing an 8 hour set at Picnic’s ‘One Night Stand’ & holding down a weekly residency with Preacha at The Spice Cellar and Zeus releasing a soothing podcast via Deep House Australia and playing at parties such as Heavenly, Bare Essentials and The House of Mince.